Swan Valley has one more thing to boast about. 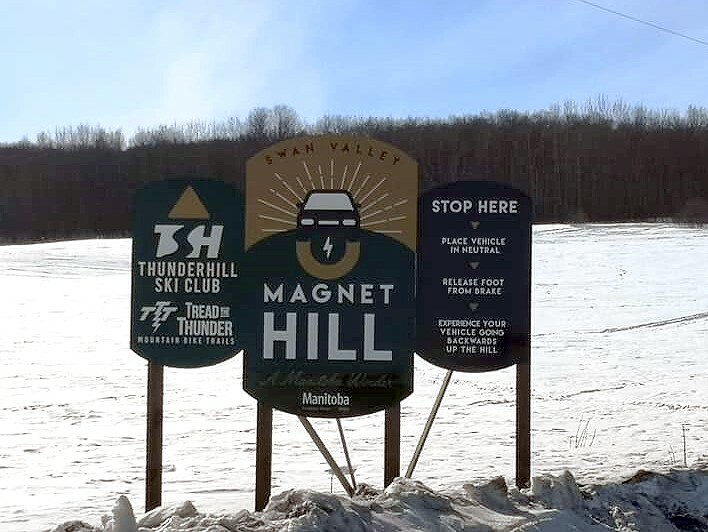 In addition to having spectacular skiing and trails, Thunderhill has something astonishing to experience on the way up; Magnet Hill, the first Manitoba Wonder in the province. Magnet Hill is a rare natural marvel you must experience to believe your eyes. Stop at the sign, place your vehicle in neutral, release your foot from the brake and experience your vehicle going backwards up the hill. With tourism identified as a significant economic driver in our area, community members along with RISE established a Tourism Development Plan. Branding and developing entities to market to our locals and visitors has been our focus. Trails have been mapped and new signs installed, with the latest for Magnet Hill. Colin Ferguson, President and CEO Travel MB said, “When exploring the Swan Valley area we went to Thunderhill Ski area where I experienced first hand Magnet Hill. After the first run back up Magnet Hill, I actually got out of the car to watch it one more time. From that moment, Magnet Hill became the first Manitoba Wonder… and for good reason. All I can say is give it a try. It literally goes against everything one would expect.” says Ferguson. The $26,000 project was made possible by a generous grant of $10,000 by Travel MB. Swan Valley RISE would like to thank Travel MB for their continued support and partnership in marketing Swan Valley. Follow the signs off hwy 83 and be amazed!